Flemish painter. He was apprenticed to Herman de Ryt in 1614 and later visited France, Italy and Germany before returning to Antwerp by 1625. He painted pantry scenes, farmyards with poultry, fish markets, game pieces, garlands and diverse still-lifes of fruit and vegetables. Game paintings are most frequent and reflect the influence of Frans Snyders. 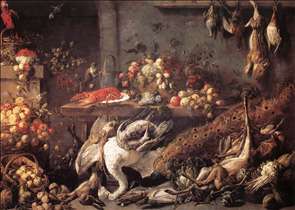 Adriaen adopted the same abundant displays of game, fruit and vegetables, usually set on a table parallel to the picture plane. Compositions typically fall in horizontal and vertical lines in contrast to the dynamic diagonals of Snyders. 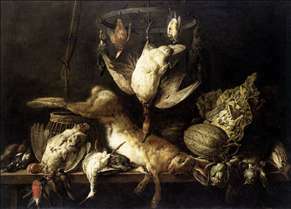 In large works, such as the Still-life with Game, Vegetables, Fruit and a Cockatoo (1650; Getty Museum, Malibu), Adriaen s accessories overflow the table on to the floor below. Baroque devices, such as a sweeping curtain and background window view, add movement and depth. 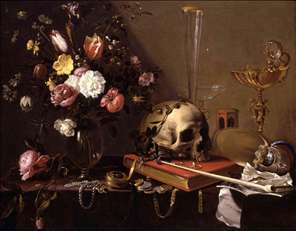 Van Utrecht favoured warm earthen tones, especially grey-green, and a strong chiaroscuro light in his still-lifes; the latter may derive from his knowledge of Italian painting. The artist s style changed little during his career, save for the gradual elimination of figures in his paintings. 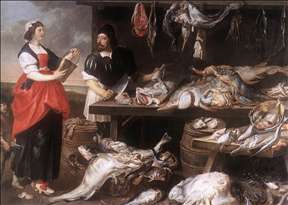 The influence of Jan de Heem and Jan Fyt can also be seen in his later work. Van Utrecht is known to have collaborated with Jacob Jordaens, Thomas Willeboirts Bosschaert (1613/14-54) and Erasmus Quellinus II. See more details about "Fishmonger's Stall"
See more details about "The Pantry"
See more details about "Still-Life with Hare and Birds on a Ring"
See more details about "Vanitas Still-Life with a Bouquet and a Skull"